This year, Tim Burton’s goth masterpiece (gothsterpiece?) Edward Scissorhands turns 25. Get your Robert Smith hair going, put on some black leather, and let’s see what you know about one of the most iconic films of the 1990s. 1. THE STUDIO WANTED TOM CRUISE FOR THE LEAD. 2. THE FILM WAS THE FIRST OF BURTON AND DEPP’S MANY COLLABORATIONS. Though he wanted to go with an unknown actor for the part, Burton compromised on Johnny Depp, who at the time was a teen idol known mostly for his television work. “I didn’t really know him,” said Burton. “I hadn’t seen that TV show he’d been in [21 Jump Street], but I must have seen a picture of him somewhere.” The film would be the first of their eight (and counting) feature film collaborations. 3. THE STUDIO WORRIED THAT EDWARD’S APPEARANCE WOULD TURN OFF MOVIEGOERS. 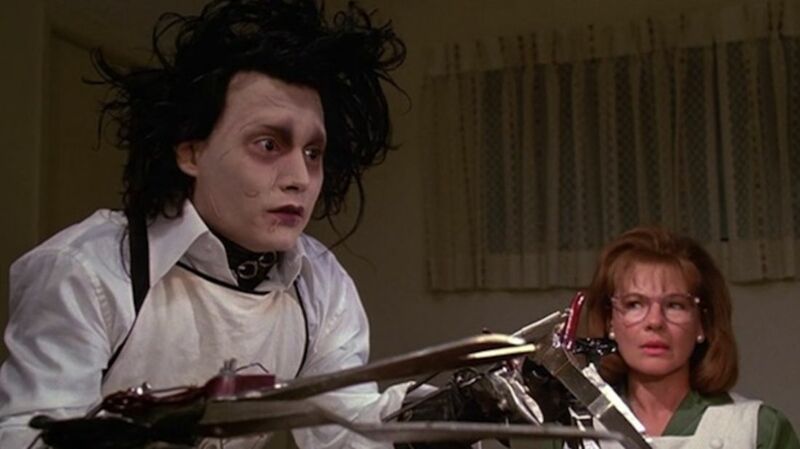 Studio execs were so worried that potential moviegoers would respond poorly to Edward Scissorhands’s appearance (it wasn’t exactly Depp’s typical look at the time) that they tried to keep images of his full ensemble from being released until the film came out. 4. STAN WINSTON BUILT EDWARD’S HANDS. Edward’s iconic hands were designed by makeup and special effects icon Stan Winston, who was best known for his work on the Terminator movies, Jurassic Park, and Aliens, among many other projects. It was Winston who decided to use real scissors for Edward’s fingers. When Winston first showed his sketches to Burton, the director responded that, “I didn’t think he’d actually have scissors for fingers. I thought they’d just be long sharp pieces of metal that weren’t finished—but this is much better!” Winston would go on to work with Burton again on Batman Returns and Big Fish. 5. THE BOGGS’S NEIGHBORHOOD IS REAL. 6. WINONA RYDER DID NOT RELATE TO HER CHARACTER. 7. THE MOVIE EXISTS, IN PART, BECAUSE OF DIANNE WIEST. 8. THE MOVIE ALLOWED BURTON TO WORK WITH A PERSONAL HERO. In the small role of Edward’s creator/father was horror legend Vincent Price, one of Burton’s personal heroes. After shooting Edward Scissorhands, Burton began interviewing Price for a documentary titled Conversations with Vincent, production on which came to a halt when Price passed away in 1993. The film was released two years later. 9. DEPP REPRISED HIS ROLE ON ONE OCCASION. 10. THERE’S A FOSSIL NAMED FOR DEPP, THANKS TO EDWARD.